Crowdy, Terry. 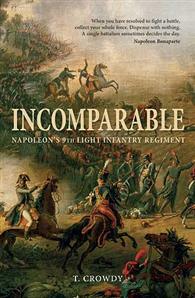 Incomparable: Napoleon's 9th Light Infantry Regiment. Oxford, UK: Osprey, 2012. 400 p. ISBN# 9781849083324.Hardcover. $29.95. It is always a pleasure to read a text which has obviously been written by someone who knows his topic inside out and can also formulate the information in an interesting, lively and entertaining manner. That has been the case with this story of the origins, career, personalities and other intimate details of the 9e Legere by author Terry Crowdy. Terry Crowdy obviously loves his subject and has spent a lot of time in the archives, sifting through the dust and the boring dross, to find the gems which lie hidden in the faded old boxes and files on this regiment. This is really in-depth research concerning the origins and history of the 9e, from its inception as a corps of light troops in the Seven Years` War (the Chasseurs de Clermont-Prince) to the glory years of Marengo and the Napoleonic heyday. We are initiated into the world of creative recruiters of the era of the Seven Years` War, who raised regiments for bounties from the crown and through whose fingers lots of monies passed - and frequently stuck. The Chasseurs de Clemont-Prince then became the Chassuers de Cevennes in 1784 as the French army, smarting after its rough handling by the Prussians in the Seven Years` War, sought to make best tactical sense of light troops. There is plenty of detail of the social composition of the officer corps, as it was changed by the Revolution, the Emigration of many officers and the subsequent reforms of 1791, and of the establishment of the regiment. The Dumouriez plot left its mark on the regiment, mercifully only a slight one. The participation of the regiment in the campaigns of 1792 - 1800 is covered in detail, as are the finer details of the uniform and there is even a full description of the regimental colour. Terry`s account includes tracing the path of the regiment through the labyrinthine twists of the Amalgamations of the line and the National Guard units of 1794 and the introduction of the demi-brigades in 1796. Inclusion of some on the inspection reports of the regiment throw interesting lights on the state of the French army of the day and of the priorities which governed the training of the men. There is repeated mention of the importance of the men being able to practice live firing, something which was not always fostered in the smaller continental armies, mostly due to reasons of financial economy. Napoleon dubbed the 9e 'Incomparable' for their timely intervention in the battle of Marengo. There is a glossary and copious footnotes to back up quotes and other salient facts, as well as a complete list of the battle participation of the regiment from 1784 to 1815. Osprey has also made available an ebook of essays by Terry Crowdy dealing with the 9e’s early history and formation prior to the Napoleonic Wars. I enjoyed this read and I am sure that many other visitors to the Napoleon Series Forum will as well.